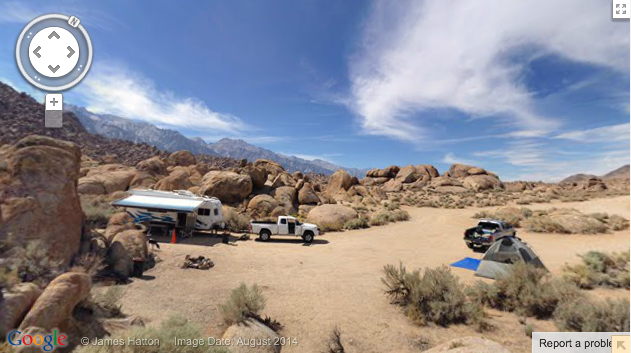 "Letting the dogs out since January 1998"
Ten photo spheres from around the Owens Valley – treat them as if you were using Google Street View. Click and hold and drag the mouse to look around, up and down. Go advanced and zoom in and out. Or go big with full-screen mode. Camping in the Alabama Hills, Owens Valley. The Cerro Gordo Ghost Town, American Hotel – 700 mines in the Cerro Gordo district searched for silver, lead and zinc ore – rough business considering the remote location. The mines were located at 8,000′ in the Inyo Mountains on the west side of Death Valley National Park. Cocktail Rock in the Alabama Hills – Overlooking the Alabama Hills with Mt. Whitney in the background. From left to right, that’s Barbara, Carol, Rick, Ron, Matt, Morgan (hiding behind Matt), and Sandy. The Salt Tram – The Salt Tram at the top of the Inyo Mountains. The tram was built around 100 years ago to transport salt from the Saline Valley, over the mountains, and down to Owens Lake for distribution. Horseshoe Meadows Road – Carol, Rick and I stopped to take in the view of Owens Valley. Below us are the switchbacks we used to climb the hill. Hiking the Trail Pass Trail – That’s Ron and Carol and Barbara on the Trail Pass Trail. Jim I agree nice pics what type of Camera are you using??? ?